I’m not even going to pretend like I’ve heard of Posole before, but a quick Google search tells me that it’s a traditional Mexican stew. This recipe is from bon appetit (April), which Luke picked up in the airport before one of his recent flights. We liked the ingredients and had a pound of pork in our freezer to use up, so we decided to give it a go. It was very tasty! I’d liken it to a chicken tortilla soup. We upped the heat a bit by using one can of miled chiles and one regular. Also, the recipe calls for 5 cups chicken broth, but there’s no need to buy more than 1 quart of chicken broth (4 cups); just use 1 cup of water and 1 quart chicken broth. Heat oil in heavy, large pot over medium-high heat. Add onions, celery and garlic. Saute until soft, about 7 minutes. Sprinkle pork with salt and pepper. Add pork to pot; cook until no longer pink on the outside, stirring often, about 3 minutes. Add broth, hominy, tomatillos, chiles, cumin and chili powder. 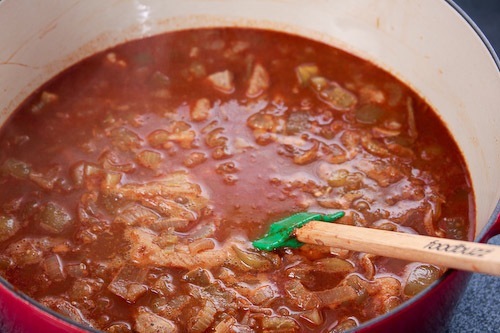 Bring to a boil, reduce heat to medium-low, and simmer uncovered until meat is tender, stirring occasionally, about 1 hour. Stir in cilantro. Season to taste with salt and pepper. Divide among bowls, sprinkle with additional cilantro, and serve. Wow! 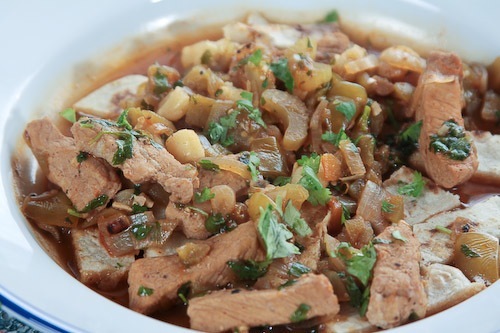 the pork posole recipe sounds delicious….never heard about this before…i can’t wait to try it and all you have to do step outside for some of the ingredients…i was wondering about the ingredients…one of my friend introduced me to a great resource where i can find a gamut of food ingredients from around the world. You can add leftover cilantro stems too. I usually ziploc bag these things as well as onion, carrot and celery scraps in my freezer until I’m ready to make large batches of stock. Saves the money of going and buying expensive boxed broths all the time. Plus it makes your house smell delicious while cooking! Now that sounds like a broth! I will have to give that a try. I might have to do a little searching for pigs feet, but I don’t think it will be too tough. Creating a broth this way is great. Pigs feet or hocks for that matter are easy to find, most major grocery stores have them frozen by the butcher counter. That’s where I find beef bones for stock too. Also adding leftover corn cobs to any latin stock creates great flavor and texture.